Electric Mobility Canada (EMC) is pleased to advise of its Third Annual student competition open to engineering and business student teams from Canadian Universities and Colleges. The competition will be held on site or via video conference as part of EV2014VÉ, EMC’s annual conference and trade show taking place in Vancouver, October 28 to 30, 2014. Teams will be presented with an electric vehicle (EV) issue to resolve. The issue will have both business and technical elements related to ‘How electric transport can make cities more liveable’. Conference details are at www.emc-mec.ca/ev2014ve. Participants will have up to one week to assess the issue, conduct research, and prepare a 10-minute PowerPoint presentation of their solution. The solution should address the issue and further promote the adoption of EVs in Canada. Teams will register on line as described below by Sept. 22 2014 and those selected for competition will be notified by Sept. 29 2014. The issue to resolve will be posed to the selected teams via conference call at 3:00 pm Friday October 17, 2014 Eastern Standard Time. Each team’s presentation materials (PowerPoint file) will be due at 4:00 pm Monday October 27, 2014, Eastern Standard Time. 10-minute presentations on site at the conference or via videoconference from each team will begin at 8:30 am Pacific time on Wednesday October 29, 2014. All presentations will be broadcast to EV2014VÉ delegates as a Plenary Session in Vancouver. 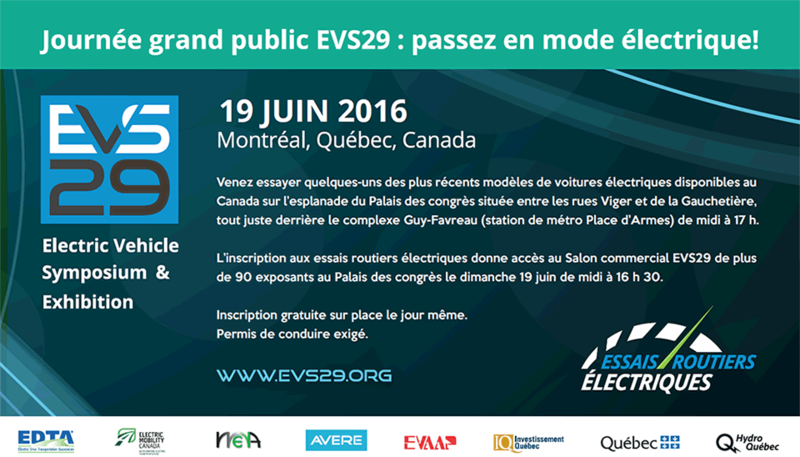 The judges panel will be comprised of EV industry representatives. The panel has the option to address one supplementary question to any or all of the participating teams. The panel will evaluate the presentations and determine the winning team. At noon on Wednesday October 29, 2014, the competition results will be announced as part of the EV2014VÉ Awards luncheon. The Winning Team will receive a public EV Charging Station from AddÉnergie, with an access to the Owner Web portal, for installation on its campus. This competition is open to students currently enrolled in a Canadian university or college engineering or business program. There is no cost to enter.